And here I sit. 2 kids already in Florida for 1/2 week already with their Nama, Papa and Aunt Denny. They are having a blast from what we are hearing. Then there is poor Ally I think she may be the most excited because for weeks now she has been saying "Today we go to Disney World?". God bless her little heart. And everyday since Jack and Meg have been gone she has said "I have no one to play with." She has had neighbor friends and babysitters galore treating her like a little princess and giving her their undivided attention. But, I understand she misses her brother and sister as does her mom and dad. I think though this 1 on 1 time has been good for Ally (maybe not mom all the time, but for her nonetheless). 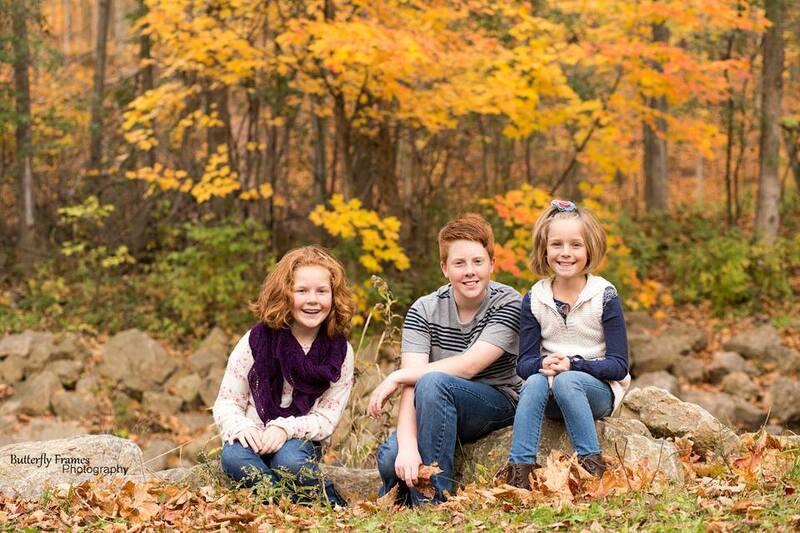 We have eaten out a lot and done a lot of running around that I dread doing with 3 kids. She has gotten to sleep with Sox every night which she has loved. And will probably be shocked when everyone is back home to have to share him with Jack and Meg. She helped me make the bracelets that the kids will where when we are at the parks that have my cell phone # listed on them. This way if anyone gets lost they can ask someone to call my #. I can't take credit for this idea. I got it out of the Disney Family Fun magazine. So, what do I hope to get out of this vacation? So much. I want to experience Disney World thru the eyes of my kids. I will watch their faces as they meet princesses and so many more characters that they have watched on TV for so long. I want to be a kid the whole time I am vacation and forget about the worries of home and work! 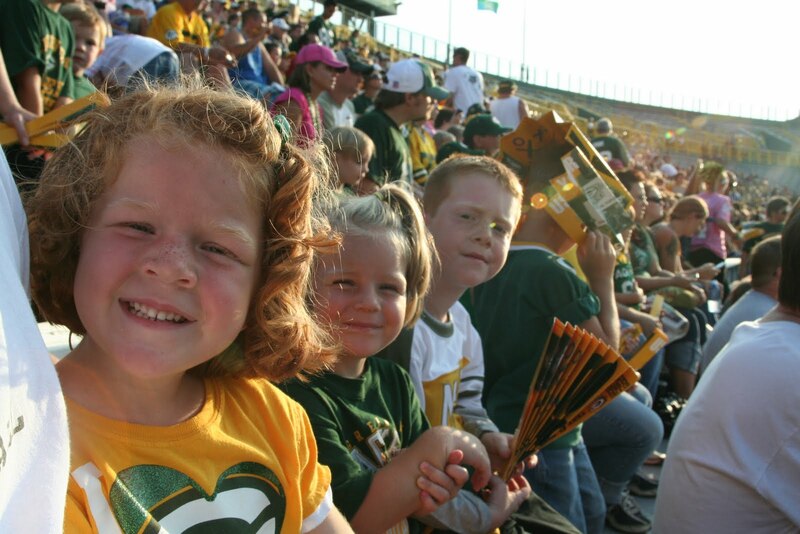 This weekend we took the kids to Packer Family Night. We tailgated with one of our neighbors and had a great time! 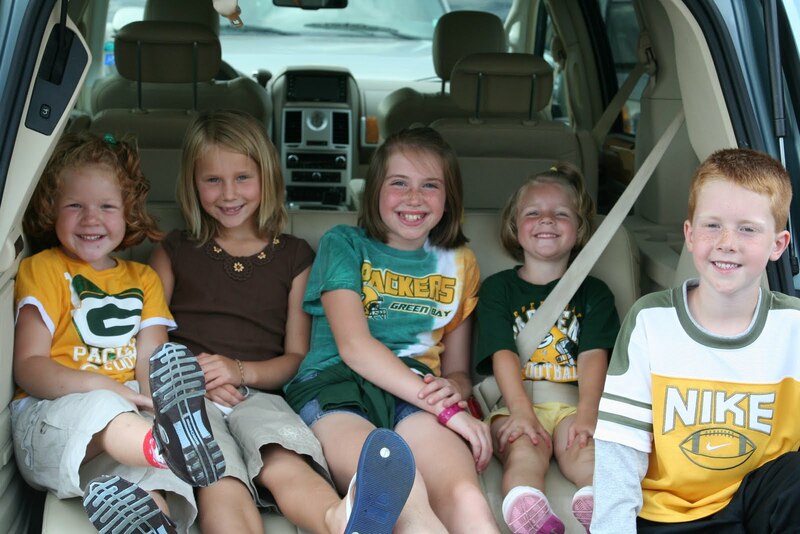 The kids were so excited to go into Lambeau Field. Of course for me I don't really understand what all the hype is about, but hey I am not a Packer fan, let alone a football fan! I got the tickets as a surprise for the family because I knew it was something they would love to do. And that is what family is all about! 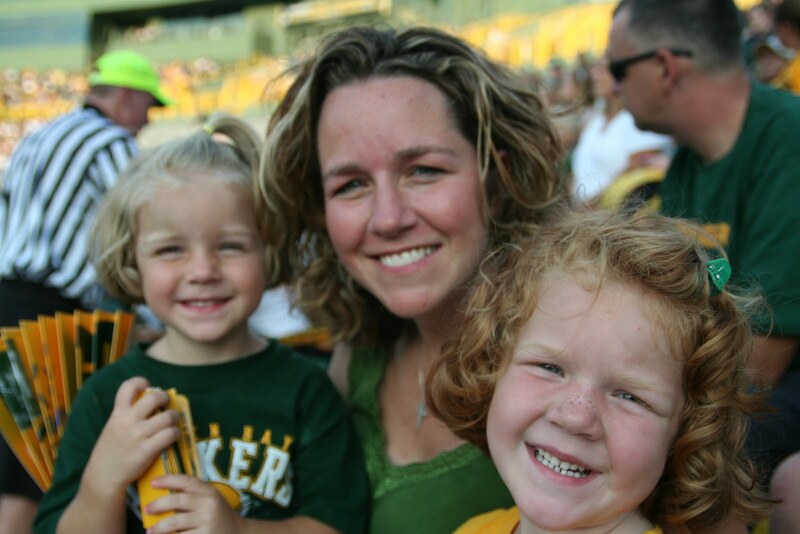 You do things that maybe you don't like because of the joy it brings your family! Anyway they handed up some neat noise makers. What am I saying??? We will see how long those last in our house before I toss them. HA! It was fun hearing all the people using them at the game. By the time the game started at 7:30 the girls had seen enough, so needless to say we did not stay for the whole game and did not get to see the fireworks. Jack was disappointed that we left early, but he got to watch the fireworks on TV at home instead.